The question is what are the best methods to help ensure a fatter wallet at the end of the year (compared to a thinner waistline – third most popular resolution)? Here are some tips to help make sure you have to find a new resolution in 2017. Make a budget. Only about 40% of U.S. adults follow a budget, according to data from the National Foundation for Credit Counseling. The best way to create a budget is to gather all of your bills from the past three months, make a list of your recurring expenses and prioritize them. Compare these costs to your monthly income. If you are spending more than you are bringing in, eliminate some non-essentials. Max out your 401(k) contributions. You should at least contribute the amount that ensures you receive the maximum employer match. If possible, put aside even more. 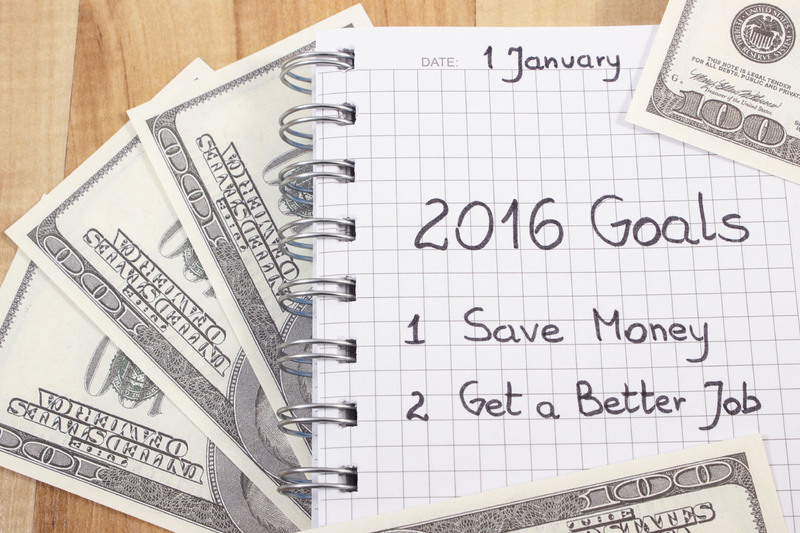 In 2016, employees can contribute $18,000 ($24,000 if you’re 50+). Those who are self-employed should contribute as much as they can for retirement through options such as IRAs and SEPs. Increase your savings. A little bit now can go a long way later, so consider transferring an extra $5-$10 per paycheck into your savings. Increase your IRA contribution from 10% to 11%. You won’t miss the money in your day-to-day life and it will grow your emergency fund, retirement savings or children’s college funds faster. Certain accounts, such as Universal Club Accounts and Super Saver Accounts from NVE Bank, offer higher interest rates for long-term growth strategies. Automate. An easy and effective method to increase savings is automating deposits. Arrange to have money withheld from your paycheck and directly deposited in a savings account. You can also set up an automated payment into your retirement account. Debt freedom. The average household credit card debt is $7,853.41 in New Jersey, ranking the Garden State 47th in the country.2 It will only get worse if you have a card with a variable interest rate, as finance charges will probably rise in 2016 due to the Federal Reserve’s plan to raise interest rates. The best way to overcome this is by eliminating the balance on the card with the highest interest rate first, while paying the minimum amount on the others. Control credit card spending by pausing before making a purchase. If you want to buy something online, leave it in your cart for at least an hour before clicking the confirmation button. You may realize that some purchases don’t seem as necessary after a break. Timely bill pay. Every penny that goes to late fees is money wasted. Keep these funds in your accounts by using online bill pay tools so you can conveniently make payments 24/7/365 from almost anywhere. Also, you can register to receive email or text message reminders as to when a payment is due. Plan for emergencies. More than half of Americans do not put money away for a crisis, according to the Financial Industry Regulatory Authority. Without money for a “rainy day,” you put yourself at significant financial risk. Building monetary reserves should be one of the first steps in any financial makeover. The goal should be 12-18 months’ net income but that can’t happen overnight. Focus on building a six-month safety net first, then concentrate more heavily on paying down your debts. This approach will help ensure you do not fall back in the red once you finally reach a zero balance on your credit cards. Raise your credit score. A poor credit rating means you will pay more in interest on your car loan, mortgage and credit cards. That’s only part of the story, though. Your credit standing impacts your insurance premiums, ability to rent an apartment, and even the types of jobs you can work. The best way to improve your credit is to maintain an open credit card account that is in good standing. The card will then report positive information to the major credit bureaus each month to build out your thin credit profile or help devalue past mistakes. Jump on your taxes: As many as a quarter of Americans wait until April to file their taxes, according to the IRS. This procrastination leads to mistakes – 2.2 million people made math errors on their returns in 2013.3 Many people also end up filing late and underpaying, so they incur expensive penalties. You can eliminate these issues by starting your tax prep early. Additionally, it will give you foresight so you can adjust your withholdings to avoid a tax deficiency, as well as ensure that you are not over- or underpaying. Be financially literate. The U.S. ranked a disappointing 14th globally for financial literacy in a 2015 survey by Standard & Poor’s. This is not only a problem for adults but the next generation, as well. Children tend to learn by example, which means you need to do your best to improve your financial performance so they learn good habits. Take steps to give your children hands-on monetary experience. Make it fun by playing games, such as Financial Football or Savings Spree, that teach young ones about the value of money and encourage positive habits. Also, talk candidly with your children about finances. Those that learn the value of a dollar and how to earn money when they are young are more likely to respect the idea of financial planning. As a Mutual Bank committed to the community, NVE Bank initiates financial literacy programs. We are active in the Teach Children to Save (TCTS) program and visit schools throughout Bergen County to talk to students about proper saving practices. The best approach is to establish specific strategies with attainable results. Remember this is a marathon, not a sprint so take small steps first. The finish line is not December 31, 2016 but years down the road. A financial planner can help you develop a program that works best for your personal situation and timeframe. To learn about NVE’s products and services, visit our website. You can also speak with one of our Branch Associates by visiting your convenient neighborhood branch, or call us at 1-866-NVE BANK (683-2265). This entry was posted in Personal Banking and tagged "online bill pay", 401(k), automated payments, Bergen County, budget, debt, financial literacy, NJ, NVE Bank, saving, savings, tips. Bookmark the permalink. https://wordpress.com/read/post/id/105552232/110 check out my blog.